I can't recall either my mother or my grandmother hooking although my mother said she hooked mats before she was married. 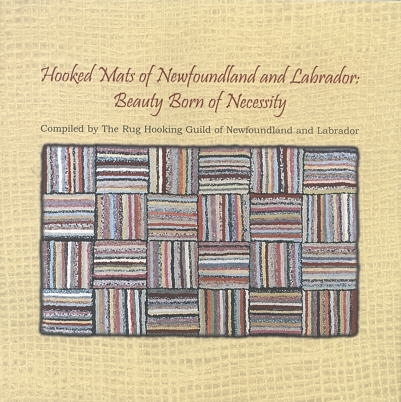 I grew up in Griquet on the Northern Peninsula, and I remember watching with fascination the two girls, Jessie Earle and Nellie Adams, who worked for us at various times making mats. They were both from Griquet as well and they worked for us as housekeepers or serving girls as we called them then. I enjoyed watching them with their mat frames and was absolutely amazed at how fast they worked. I think I also tried it myself when I was between 5 and 10 years old and thought no one was watching. It was those memories that prompted me in the late 60's to make a mat. I was working as a nurse in Grand Falls and during a visit home to Griquet I had a local man, Everett Earle make me a mat frame. There were no courses in mat-making at that time, so I had to rely on my memories of Jessie and Nellie as I laced the burlap to the frame and practised hooking in horizontal lines. I made my first mat with multicolored crimped material, but the technique wasn't quite right as it curled under about two inches. It still won't lie flat. My second attempt, in 1990 was more successful. Of course, when I did the workshop that started the rug hooking guild in 1995 I got started on my way to new and more creative ways of hooking. Now you can say, "I'm hooked." Ina Budgell, RHGNL member, Grand Falls -Windsor.